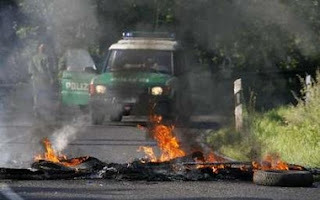 Heiligendamm, Germany - Protesters successfully blocked all roads leading to the G8 summit where the heads of state of some of the eight most powerful nations are meeting in a closed door session this week. Many of their aides had to be flown in by helicopter after the roads were made impassable by decentralized groups of primarily anti-capitalist demonstrators determined to disrupt the meeting in protest. Police used water cannons and pepper spray against protesters who breached the more than seven-mile long security fence topped with razor wire. Some demonstrators hurled rocks and other projectiles at police, but caused far less damage than they did during Saturday's protest in Rostock. 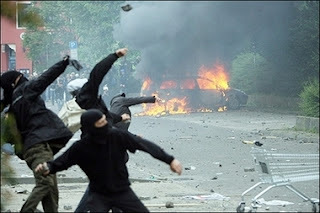 Smaller anarchist organized solidarity demonstrations were held simultaneously in a host of cities and countries around the world including São Paulo, Brazil, Houston, Texas, U.S., Costa Rica, and Copenhagen, Denmark among others.